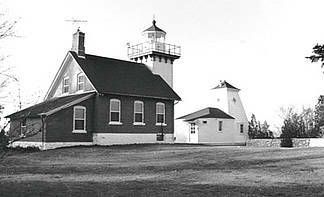 The Building of the Sherwood Point Lighthouse in 1883 was intimately connected to the construction of the Sturgeon Bay Ship Canal. Before the completion of the canal Sturgeon Bay was an important warm weather port, though it was relatively minor because it has a short season than Jacksonport and Baileys Harbor on Lake Michigan. Many years that found Green Bay locked in winter’s icy grip, Lake Michigan waters were almost free of ice. After years of controversy, as it became apparent that the canal would be built and Sturgeon Bay would expand as a port, maritime interests began demanding additional aids to navigation in anticipation of greatly increased traffic in Sturgeon Bay. On March 3, 1881, Congress appropriated $12,000 for the construction of a lighthouse to assist mariners entering Sturgeon Bay from Green Bay. In December 1881, the Lighthouse Board selected a site on Sherwood Point for the new lighthouse. While it was hoped the lighthouse would be built during 1882, construction was delayed because of problems securing clear title to the land. In May 1883, a Lighthouse Board crew of twenty men from Detroit landed building materials near the site and began clearing the land. After extensive blasting, the crew built a rock foundation for the dwelling and light tower. Masons then built a 25′ x 37′ two story brick dwelling with attached light tower. Sherwood point is unique in that it is the only Door County lighthouse built with red brick rather than limestone or cream colored brick. Atop the tower, the crew assembled a 10-sided cast iron lantern. The height of the tower from base to top of the lantern was 35′ and the focal plane of the lens was 61′ above the water. After four and a half months of intense labor, the crew completed the station on September 28, 1883. The Lighthouse Board transferred keeper Henry Stanley from the Eagle Bluff Lighthouse. On October 10, 1883, Stanley officially lighted the lamp to begin operations. 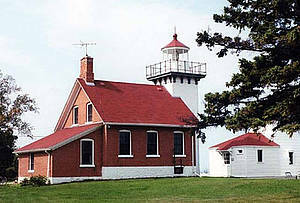 The Sherwood Point lantern displayed a fixed white light alternated with a flashing red light visible in clear weather for 15 miles. Unfortunately for Stanley, the light’s complicated mechanism had a seemingly irreparable defect which periodically caused it to stop operating. In 1892, the original illuminating apparatus was discarded and entirely replaced with equipment from another lighthouse. The replacement lens was a fourth order Fresnel lens built in Paris, France. Also in 1892, a square wooden pyramidal fog signal was built in front of the light tower. It originally had a bell that was automatically struck every twelve seconds in foggy weather. In the fall of 1884, Mrs. Stanley’s niece, Miss Minnie Hesh of Brooklyn, New York, came to Sherwood Point for a short visit after the deaths of her parents. However, like many Door County visitors, Minnie Hesh decided to stay. Five years later, she married William Cochems the son of a prominent Sturgeon Bay businessman. In 1894, Cochems became acting assistant keeper and, upon Stanley’s death October 13, 1895, the Lighthouse Board appointed Cochems keeper. In 1898 Minnie was appointed assistant keeper, a post she held until her death August 17, 1928. She is memorialized by a small marker northeast of the lighthouse near the road. In 1933 William Cochems retired. Conrad Stram, the last civilian keeper at Sherwood Point replaced Cochems. In 1941, after the Coast Guard had taken over the operation of lighthouses, Stram transferred to the Coast Guard. After Stram’s retirement in 1945, Coast Guardsmen manned the light until the fall of 1983 when the light was automated. 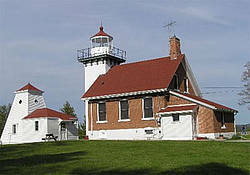 At that time, Sherwood Point was the last manned lighthouse on the Great Lakes.